Princess Michael of Kent's mother is Baroness Maria von Reibnitz. Did Baroness Maria have any tiaras that Lady Gabriella could use for her wedding? Not really, she even worked as a hairdresser before she met Prince Michael to make ends meet, her air of grandeur appeared after the wedding, but until then... she was a rather obscure minor former aristocrat, remember those titles are not valid anymore after 1918. She has 2 real tiaras, both inherited from her mother in law, HRH The Dowager Duchess of Kent, Princess Marina, née Princess Marina of Greece and Denmark. 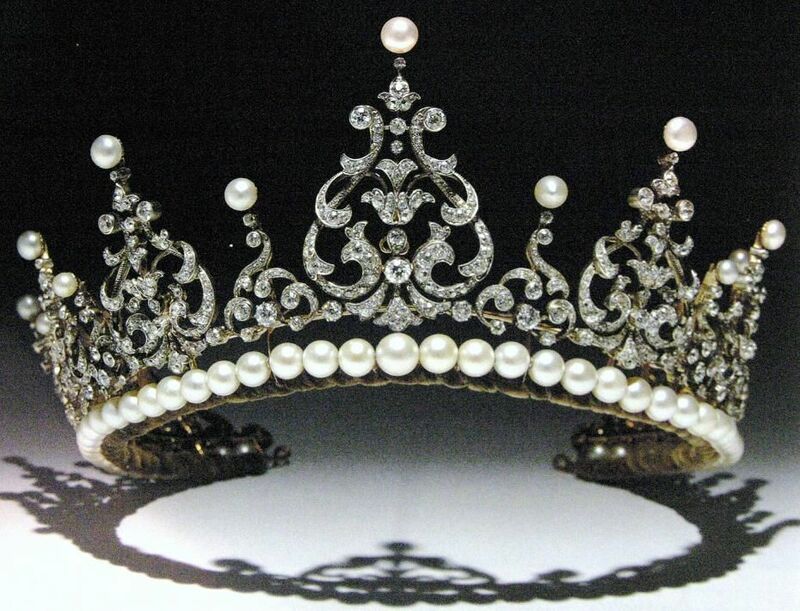 The fringe was given to Marina as a gift from the city of London, the second tiara is unknown. I know there are a few things she used as tiaras, i.e. some diamond daisies, those were used at the HSH Princess of Mónaco's wedding, but they look odd to say the least. The row of pearls was added by Princess Michael. Here's the second version of the tiara inherited by Prince Michael, worn here by Princess Michael. It has an additional row of gems above the fringe. As a baby, Marie Christine fled wartorn Austria with her parents Baron Gunther and Baroness Maria von Reibnitz. The couple later split up, leaving Marie Christine's mother to scrape a living as a hairdresser. " It would be my guess that there is no inherited maternal jewelry that could be worn. Could her father arrange a loan of a tiara from the Queen? Who knows. There are a number of small pieces that could be lent to the bride. Or perhaps a piece could be rented for the day from a quality jeweler. Have they sold their tiara? No, but that there was a rumour, that she switched some diamonds from paste in her tiaras, of course, uncofirmed. Both tiaras remained within their family. I guess they would be sold eventually, after their passing, neither Freddy nor Gabriella have any use for them. A pity, of course. Much and good from P Margaret's estate was auctioned a few years ago.Even her wedding tiara. I suppose taxes and insurance must be exorbitant. They kept small trinkets, plus the Teck circle tiara/necklace, and the the Persian turquoise parure, they first auctioned it, and then bought it back when they realized what they've done. This has been confirmed by the 2nd Earl Snowdon. Lady Gabriella does not seem so over the top as her mother, so I would not be surprised whether she chooses to wear something tiny, instead of some of her mother tiaras. Still, I'd love to see that fringe, it's a way of keeping her grandmother wedding tradition, and most likely the last chance we will see in it action. There are huge chances it would go to auction when they inherit them. A pity, of course. Is anyone as grand as Princess Michael? She both horrifies and amuses me. Did they retrieve both tiaras? Nope, just the Persian Turquoise Parure, it's also known as THE TRIUMPH OF LOVE, all too sweet to my taste, this includes a tiara, earings, a brooch and a necklace. I'm not so sure about a bracelet. I like the Poltimore tiara much better. Not very fond of turquoise. We should take this to the right thread. Sorry everybody.Well, most of the pieces used to belong to the BRF?, right? Let's close the theme, for it's related, I won't discuss Pss Margaret's jewelry so we can stay on topic. None of Princess Michael's tiaras, to the general knowledge, comes from a direct line of either the Windsors or the Glücksburgs (Greece / Denmark). - The Fringe was a presente from The City of London to HRH Princess Marina of Greece and Denmark upon her marriage to HRH Prince George, Duke of Kent. - The Festoon tiara, the one I posted before, not much is known of it. It was given at some moment to Pss Marina from her husband, Prince George. Those tiaras were inherited by his smallest children, she didn't leave anything to her daughter (in royal circles, princesses use their husband's family heirlooms), and the lion share (or what was left of it, since Pss Marina had to sell things very early on to make ends meet), were left to Edward, her eldest. Now, it is not that well known, but some of the jewels were sold after Marina's passing, inheritance taxes could be a pain in the a***, you see. Then, of course, she inherited a few things from Wallis, yes, that Wallis, brooches and all. Minor things, Marina also left a few necklaces, earrings, and stuff. They also sold some, my guess is the same, inheritance taxes.